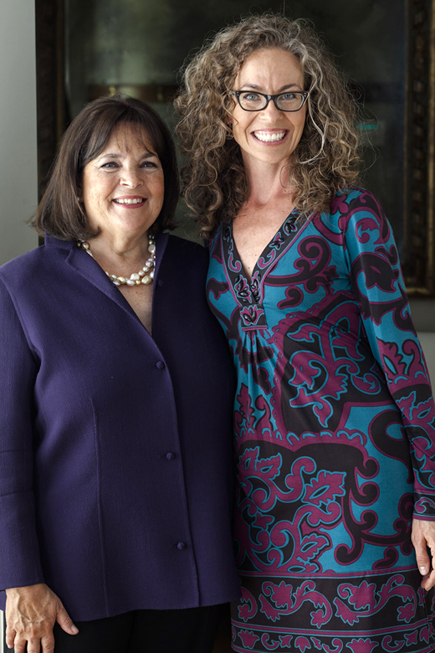 I just wanted to share a mind-blowing-adventure I had with Ina Garten. The Ladies’ Home Journal invited me and a few other food bloggers to attend Ina’s very first holiday cookie swap. I, of course, went with our bread books tucked under my arm, hoping Ina would be willing to add them to her extensive library. Being the consumate host, she accepted the books with utter grace and excitement. Ok, my real hope is that she will become a 5 minute bread baker! You can read all about my time at Ina’s house and see some behind the scenes, post champagne pictures at ZoeBakes. And, Ladies’ Home Journal is hosting a contest, which results in a lucky winner getting to have lunch with the Barefoot Contessa. She is delightful, so enter and I hope you win! Like so many others, I *love* Ina! Ohhhhhh, I am green with envy! I love Ina. How long does the bread stay fresh? I would love to bake a loaf for my in laws who live in another state as a Christmas present since they love bread. Have you had any experience mailing the bread? Thanks! Like Ina as well, I will be using one of her recipes as well as Christmas present. Which book are you using and I can help to steer you in the right direction. Breads that are made with all white flour and have no fats or sugars tend to become stale the fastest. you (not yo) …i meant to say you! It was VERY exciting for me to go into my local CVS yesterday, see the Ladies Home Journal with Ina on the cover, and open the page to Zoe’s smiling face! Barefoot Contessa’s silicone spatulas are the best for mixing up the wet dough. You’ll never go back to a wooden spoon. I came to site to comment about it and found Contessa mentioned. I also want to mention yeast. I get very different results with different brands both fresh and both in jars. Western Family==small air holes.dense: Fleishman’s far more open texture. I was amazed at difference.Both good.